Objective: To determine the sensitivity and specificity of methods to detect anti–basal ganglia antibodies (ABGA) in Sydenham’s chorea (SC). Background: SC is a delayed manifestation of group Aβ hemolytic streptococcal infection typically associated with rheumatic fever (RHF). SC is characterized by chorea and motor and neuropsychiatric symptoms. Patients with SC produce antibodies that cross-react with streptococcal, caudate, and subthalamic nuclei antigens detected using an immunofluorescent (IF) method with inconsistent reports of positivity. Methods: The authors developed ELISA and Western immunoblotting (WB) methods to detect ABGA and compared these assays to IF. They investigated samples from patients with acute SC (n = 20), persistent SC (n = 16), control samples from RHF (n = 16), and healthy pediatric volunteers (n = 11). Results: ABGA ELISA had a sensitivity of 95% and specificity of 93% in acute SC. Both WB and IF had a sensitivity of 100% and specificity of 93%. In the persistent SC group, ABGA sensitivity dropped to 69% using WB and to 63% using IF. Three common basal ganglia antigens were identified by WB in both acute and persistent SC (40 kDa [n = 15], 45 kDa [n = 15], and 60 kDa [n = 13]). There was no antibody reactivity to cerebellum, cerebral cortex, or myelin antigen preparations in any group. Conclusions: These results support the hypothesis that Syndenham’s chorea is an autoantibody-mediated disorder. Western immunoblotting and immunofluorescence are the best methods for detecting anti–basal ganglia antibodies, and reactivity to basal ganglia antigens of 40, 45, and 60 kDa were commonly seen in both acute and persistent cases of SC. Previous studies have shown that patients with SC produce antibodies that cross-react between the rheumatogenic strains of streptococci and human basal ganglia proteins.7 The antibody is thought to derive from an immune response to streptococcal M protein, which cross-reacts with shared epitope(s) in the basal ganglia.7 SC therefore may be an example of autoimmune molecular mimicry. The basal ganglia antigens have yet to be identified, so the functional effects of antibody binding are unknown. Previous studies have used an immunofluorescent (IF) method for detecting basal ganglia antibodies in patients with proposed autoimmune, poststreptococcal neurologic disease. Antibodies against caudate and subthalamic nuclei have been reported in 46% of patients with SC in one study11 and 100% in acute and 93% in chronic SC patients in another study.12 Because of the inconsistency of these results and the small percentage of patients with basal ganglia antibodies in one of the studies, the role of antibodies in an autoimmune SC model is still unclear. Case studies indicate that treatment with immune-modulating drugs such as IV immunoglobulin and steroids has a beneficial effect on decreasing symptoms,13 furthering an immune-mediated pathophysiology in SC. We investigated serum samples from patients with acute and persistent SC and control samples from patients with ARF and healthy volunteers. All samples were tested using an in-house semiquantitative basal ganglia ELISA and Western immunoblotting coupled with standard IF to detect anti–basal ganglia antibodies (ABGA). We aimed to establish the sensitivity and specificity of these assays compared with the standard IF technique. To assess neuronal specificity of the antibodies, we also investigated the presence of antibodies against other brain tissue, including cerebellum, cortex, and myelin. All patients were examined and diagnosed by an associate professor of clinical neurology (F.C.). All patients and control subjects provided signed consent for this study, which was authorized by the local ethics committee. All samples were stored at −20 °C until required. SC was diagnosed if the patient had acute onset of chorea, met the modified Jones criteria for ARF, and if other causes of chorea were excluded.14 Acute SC was diagnosed if the patient had chorea lasting less than 2 years’ duration, regardless of the use of neuroleptics or valproic acid. Persistent SC was diagnosed if the chorea lasted 2 or more years, regardless of the use of neuroleptics or valproic acid. Patients with rheumatic fever fulfilled modified Jones criteria but had no apparent neurologic complications. Healthy volunteers had no evidence of neurologic disease and were recruited from the outpatient pediatric clinic of the Federal University of Minas Gerais, Brazil. None of the patients or control subjects was taking corticosteroids or other immunosuppressive treatment regimens. The demographics of the patients are summarized in table 1. Ten-micrometer sections of normal human basal ganglia (caudate and putamen) were cut from snap frozen tissue. Control and patient sera were diluted 1:10 in phosphate-buffered saline (PBS), overlaid on prepared slides, and incubated for 30 minutes. A control slide was also prepared and incubated with PBS for 30 minutes to assess background fluorescence. 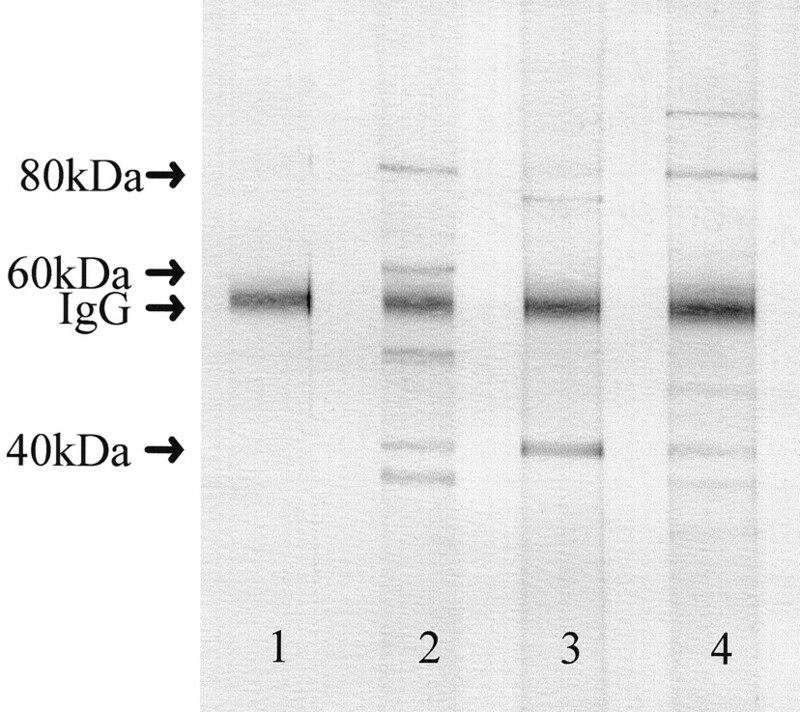 All slides were washed in PBS and incubated with anti–human IgG conjugated with fluorescein isothiocyanate conjugated (Dako, UK) and analyzed using a fluorescence microscope. Caudate, putamen, and globus pallidus from a patient with no evidence of neurologic disease was provided by the UK PD Society’s Brain Bank, Institute of Neurology, London. The block of tissue was homogenized with a small volume of saline containing protease inhibitors (Sigma chemicals, Poole, Dorset, UK) and centrifuged for 30 minutes at 12,000 RPM. An equal volume of supernatant and Di-iso-propyl-ether (BDH) was mixed together and centrifuged at 3,000 RPM for 10 minutes to remove lipid from the supernatant. The protein fraction was then collected and stored at −80 °C until required. The ELISA was modified from a previous reported method15 and performed using 96-well microtiter plates (Life technologies, UK). The protein concentration of the homogenate was determined and normalized. The antigen preparation was then diluted in 0.05 M carbonate buffer (pH 9.0) to a concentration of 1 μg/mL. The diluted homogenate was added to each well and left overnight at 4 °C. The plate was washed four times with 0.2% bovine serum albumin (BSA) in PBS with 0.05% Tween 20 (Sigma). The plate was blocked with 2% BSA/PBS and incubated for 1 hour at room temperature before washing four times with 0.2% BSA/PBS and 0.05% Tween 20. Serum samples were diluted at 1:300, a dilution previously determined by multiple ELISA tests using ABGA indirect IF-positive (SC) and -negative samples (normal control subjects). For the blank wells, serum was omitted and a previously identified positive and negative sample was run on each plate as a quality control. All samples were tested in duplicate. The plate was incubated for 1 hour at room temperature and washed as previously described. Freshly prepared 1:2,000 diluted anti–human IgG conjugated with horseradish peroxidase (Dako, Cambridge UK; P-0406) was added to each well and incubated for 1 hour at room temperature. The plate was washed as previously described. Color reagent o-phenylenediamine was added to each well. The plate was allowed to develop in the dark for a maximum of 15 minutes. The reaction was stopped with the addition of 1 M HCl to each well. The absorbance was read on a plate reader at 492 nm wavelength with a reference filter of 405 nm (Denley, UK). A negative cutoff value was calculated from the mean ELISA absorbance of the healthy controls plus 2 SD (see table 1). Samples from 400 UK children with uncomplicated streptococcal infection have been analyzed to validate the ELISA method and the cutoff value (data not shown). WB was carried out using the same homogenate as that used in the ELISA. The homogenate was mixed with lithium dodecyl sulfate sample buffer (Invitrogen), containing 0.05 M dithiothreitol (DTT) and heated at 65 °C for 15 minutes. A total of 30 μg of protein was loaded onto a 4 to 12% Bis-Tris gel (Invitrogen) and electrophoresed. The proteins were blotted onto nitrocellulose (Sartorius, Epsom) and blocked with 2% milk proteins for 2 hours. Samples were diluted at 1:300, applied to the blot, and incubated overnight at 4 °C. The nitrocellulose was washed with 10 changes of 0.9% saline containing 0.2% milk proteins and 0.025% Tween. The blot was incubated for 2 hours with rabbit anti–human IgG conjugated with horseradish peroxide diluted at 1:1,000 (Dako, Cambridge, UK). After washing, the substrate 4-chloro-1-naphthol (Sigma) was added and the blot was allowed to develop for 15 minutes. Myelin, cerebellum, and cortex neurons WB. 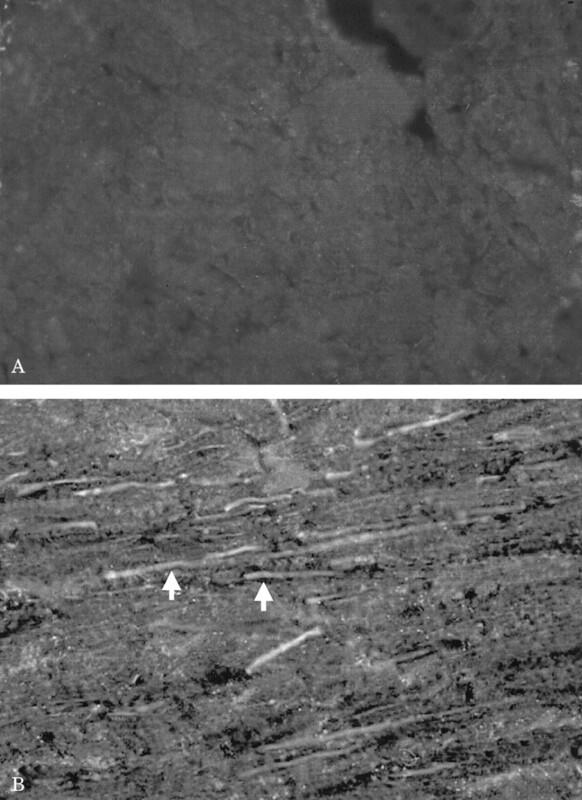 The myelin, cerebellar, and cortical antigens were prepared identically to basal ganglia tissue, except the myelin preparation was not treated to remove lipid from the supernatant. These techniques are routinely used in the Neuroinflammation Unit for identifying antibodies associated with paraneoplastic disorders. All statistical analyses were done using SAS software (SAS Institute, Inc., Cary, NC). Independent variables were compared using the nonparametric two-sample exact Wilcoxon’s rank sum test. Analysis of raised ABGA in each group was carried out using χ2 tests. One hundred percent (20/20) of patients with acute SC and 63% (10/16) of the patients in the persistent SC group had specific IgG binding to large striatal neurons (table 2, figure 1, A and B). Thirteen percent (2/16) of the ARF cases but 0% (0/11) of the normal control subjects also had binding to large striatal neurons. There was no difference in the neuronal staining pattern between acute SC, persistent SC, and the two ABGA-positive rheumatic fever cases. ABGA binding was not ubiquitous throughout the caudate or putamen but appeared to be confined to tracts of neurons in the caudate head, with no binding to other striatal constituents. Figure 1. (A) Immunofluorescence staining of normal control showing no IgG binding to neurons. (B) Immunofluorescence staining of acute Sydenham’s chorea demon- strating IgG binding confined to neuronal tracts in the caudate head. The mean ELISA absorbance in the SC group was increased compared with either the normal control subjects (p < 0.001) or patients with ARF (p < 0.001) (see tables 2 and 3⇓). Subgroup analysis showed patients with acute SC had a higher mean ABGA than the patients with persistent SC (p = 0.03) and the control groups (p < 0.001). Patients with persistent SC also had a higher mean ABGA level than normal subjects (p = 0.002) or ARF control subjects (p = 0.003) (see table 3). The mean ABGA absorbance of the healthy control group plus 2 SD was used as an ELISA cutoff for positivity (0.33 absorbance units). Using this value, 95% (19/20) of the acute SC group, 56% (9/16) of the persistent SC group, 78% (28/36) of the entire SC cohort, 13% (2/16) of the ARF group, and 0% (0/11) of the normal control subjects had an elevated ABGA ELISA (see table 2). Using WB, 100% (20/20) of the acute SC group, 69% (11/16) of the persistent SC group, 86% (31/36) of the entire SC cohort, and 13% (2/16) of the ARF control subjects had reactivity against basal ganglia proteins (table 4, figure 2). None of the healthy controls had any binding. There was reactivity to a number of basal ganglia antigens in acute SC, but 40 kDa (10), 45 kDa (10), and 60 kDa (8) were the most common antigens in the acute SC group; only 15% (3/10) had no reactivity to any of these antigens. The most common antigens in the persistent SC group were 40 kDa (5), 45 kDa (5), and 60 kDa (5); all of the positive cases had reactivity to at least one of these antigens. The two patients with ARF who were positive by both ELISA and IF had reactivity to a 40-kDa antigen. We detected native IgG from the human tissue donor, as is expected when using human tissue homogenates (see figure 2). Figure 2. Western immunoblotting. IgG reactivity from donor preparation is seen in all lanes. Lane 1: healthy control (negative); lane 2: SC (positive 30, 40, 45, 60, and 80 kDa); lane 3: SC (positive 40 and 67 kDa); lane 4: SC (positive 30, 40, 80, and 95 kDa). Sensitivity and specificity of the ABGA tests. The sensitivity of indirect IF was 100% in the acute SC group, 63% in the persistent SC group, and 83% in the entire SC cohort (see table 2). The specificity of indirect IF was 93%. The sensitivity of the ABGA ELISA was 95% in the acute SC group, 56% in the persistent SC group, and 78% in the entire SC cohort. The specificity of the ELISA was 93%. The sensitivity of the ABGA WB was 100% in the acute SC group, 69% in the persistent SC group, and 86% in the entire SC cohort. The specificity of WB was 93%. Cerebellum, cortex neurons, and myelin WB. There was no binding to any of these antigens in any of the SC patients or control subjects. Previous ABGA studies of SC and PANDAS using an indirect IF method detected ABGA in only a small percentage of patients (44% and 46%).11,16⇓ In comparison, ABGA was also reported in 100% of acute (n = 10) and 93% of chronic SC (n = 13) patients, also using IF.12 The IF method relies on subjective determination of IF (number of neurons and intensity of staining), which may explain the differences in positivity. The acute SC results from our indirect IF method were in accordance with previous studies, although the percentage of positive ABGA in persistent cases was lower.12 Because of the subjectivity of IF interpretation, we chose to examine two different methods for studying ABGA. Our ABGA ELISA method used a negative cutoff value, which allowed for a semiquantitative analysis of results. Using this cutoff, 78% of the total SC cohort was ABGA positive and subgroup analysis detected 95% acute and 56% persistent SC ABGA positivity. The ELISA is therefore as sensitive and specific as IF when detecting ABGA, but does not rely on the subjective interpretation of IF. None of the healthy controls was ABGA ELISA positive. The 13% ELISA positivity of the ARF patients was in accordance with the previous reported positivity of 14% in ARF.11 Psychiatric manifestations have been described in patients with ARF without SC.17 It is tempting to speculate that there may be a relationship between ABGA positivity and ARF patients with psychiatric complications. The 93% specificity of the WB method was comparable with both the ELISA and IF methods. The most frequent basal ganglia antigens recognized by both acute and persistent SC sera were 40, 45, and 60 kDa. This characteristic WB reactivity has been reproduced in UK SC patients (data not shown). Importantly, we have shown that sera from patients with SC do not react against human cerebellum, cortex, or myelin antigens, which shows that patients with SC have antibodies that only bind to basal ganglia proteins and not to other areas of the brain. Using WB and IF, ABGA were found in 100% of patients with acute SC, which does support an autoantibody-mediated pathology. The percentage of ABGA positivity falls in cases of persistent SC, which may indicate that ongoing antibody production may not be the cause for persistent chorea in all cases. The basal ganglia may be damaged in the acute phase and may result in permanent dysfunction and, consequently, persistent chorea. Alternatively, small concentrations of autoantibodies that are not detected using available methods may be present. Measuring ABGA titers over time will be required to assess the relationship between severity and persistence of SC. WB and indirect IF appear to be the best methods for detecting ABGA. However, because of the lack of quantitative assessment, ELISA may be a useful instrument in monitoring ABGA levels over time, which in turn may be useful in assessing treatment strategies. This study demonstrated that ABGA are universal in acute SC. We hypothesize that ABGA are central to the pathology of SC, possibly by alteration of corticostriatal circuits. Identification of the autoantigens and their role in basal ganglia function is crucial in determining whether ABGA has functional effects on striatal neuron metabolism. The IF staining pattern showed that ABGA bound to large striatal neurons that appeared to be present in tracts of neurons. Based on this finding, whether ABGA binds to the large striatal aspiny interneurons must be further investigated. Further characterization of these neurons by immunohistochemistry is required to positively identify them. Demonstrating the type of neuron stained by ABGA may provide insights into the specific neuronal pathways involved in SC. Supported by Action Research UK (R.C.D.) and the Barnwood House Trust (R.C.D.). The authors thank UK PD brain bank, Institute of Neurology, University College London for supplying brain tissue. Cardoso F, Eduardo C, Silva AP, Mota CC. Chorea in fifty consecutive patients with rheumatic fever. Mov Disord . 1997; 12: 701–703. Eshel G, Lahat E, Azizi E, Gross B, Aladjem M. Chorea as a manifestation of rheumatic fever-a 30-year survey (1960–1990). Eur J Pediatr . 1993; 52: 645–646. Aron AM, Freeman JM, Carter S. The natural history of Sydenham’s chorea: review of the literature and long term evaluation on cardiac sequelae. Am J Med . 1965; 38: 89–93. Swedo SE, Leonard HL, Schapiro MB, et al. Sydenham’s chorea: physical and psychological symptoms of St. Vitus dance. Pediatrics . 1993; 91: 706–713. Cardoso F, Vargas AP, Oliveira LD, Guerra AA, Amaral SV. Persistent Sydenham’s chorea. Mov Disord . 1999; 14: 805–807. Bronze MS, Dale JB. Epitopes of streptococcal M proteins that evoke antibodies that cross-react with human brain. J Immunol . 1993; 151: 2820–2828. Giedd JN, Rapoport JL, Kruesi MJ, et al. Sydenham’s chorea: magnetic resonance imaging of the basal ganglia. Neurology . 1995; 45: 2199–2202. Colony HS, Malamud N. Sydenham’s chorea: a clinicopathologic study. Neurology . 1956; 6: 672–676. Greenfield JG, Wolfsohn JM. The pathology of Sydenham’s chorea. Lancet . 1922; 2: 603–606. Husby G, Van de Rijn I, Zabriske JB, Williams RC. Antibodies reacting with cytoplasm of subthalamic and caudate nuclei neurons in chorea and acute rheumatic fever. J Exp Med . 1976; 144: 1094–1110. Kotby AA, El Badawy N, El Sokkary S, Moawad H, Shawarby M. Antineuronal antibodies in Rheumatic Chorea. Clin Diag Lab Immunol . 1998; 5: 836–839. Green LN. Corticosteroids in the treatment of Sydenham’s chorea. Arch Neurol . 1978; 35: 53–54. Special Writing Group of the Committee of Rheumatic Fever, Endocarditis, and Kawasaki Disease of the Council on Cardiovascular Disease of the Young of the American Heart Association. Guidelines for the diagnosis of rheumatic fever. JAMA . 1992; 268: 2069–2073. Singer HS, Giuliano JD, Hansen BH, et al. Antibodies against human putamen in children with Tourette syndrome. Neurology . 1998; 50: 1618–1624. Kiessling LS, Marcotte AC, Culpepper L. Anti-neuronal antibodies in movement disorders. Pediatrics . 1993; 92: 39–43. Mercadante MT, Busatto GF, Lombroso PJ, et al. The psychiatric symptoms of rheumatic fever. Am J Psychiatry . 2000; 157: 2036–2038.